Many art materials are inherently hazardous, including toxic solvents and many metals, corrosive acids and alkalis, flammable solvents and combustible materials such as wood dust, and so forth. However, artists not only have to be concerned about the hazardous properties of their art materials, but also have to be concerned about hazardous chemical reactions that can occur. These hazardous reactions can occur in two basic ways: first, many art processes result in the production of toxic chemicals or other hazards as by-products of the process; and, second, many art materials are incompatible with other chemicals and can create toxic chemicals if they are accidentally mixed. In addition, some art materials are incompatible with heat, ultraviolet radiation, and other physical processes. These decomposition products and incompatibilities should be listed in the Reactivity section of Material Safety Data Sheets. Many art processes such as acid etching, acid pickling, kiln firing, photographic developing, patina application, etc. involve chemical reactions to produce the desired effect. However, these chemical reactions often produce other chemicals which are hazardous. For example, nitric acid etching on zinc plates involves a chemical reaction in which the zinc metal is converted into soluble zinc ions, thus creating etched lines or areas in the parts of the plate that are not covered with acid-resistant grounds or resists. This same chemical reaction, however, also converts the nitric acid into nitrogen oxide gases, including nitrogen dioxide which can cause chemical pneumonia and emphysema. Flammable hydrogen gas is also produced. Thus there is the need for local exhaust ventilation to remove these unwanted gases. Many art processes also create physical hazards such as noise, vibration, ultraviolet and infrared radiation. In particular, glassblowing, metal melting, pottery and enameling kiln firing all produce infrared radiation and heat. Arc welding, carbon arcs and neon sculptures produce ultraviolet radiation. See Table 1 for a list of art processes and their hazardous chemical by-products. Acids, oxidizers, oxygen, heat and ultraviolet radiation are common examples of chemicals and physical agents that are often incompatible with art materials. Acids can react with many chemicals. Often artists take advantage of this to create a desired effect, for example, acid etching as described above. Often however, these reactions are not intended or desired and can create hazards. Acids, for example, can react with ammonia and other alkalis to neutralize them. This neutralization reaction produces large amounts of heat which can result in spattering of boiling acid and alkali. Acids can also react with cyanides and other chemicals to produce poison gases (e.g., hydrogen cyanide). Oxidizers are chemicals that can react with solvents, charcoal, wood dust, and other finely divided organic materials to cause a fire or explosion. Examples of strong oxidizers are concentrated nitric acid, dichromates and chromates, nitrates, and potassium chlorate. Oxygen in the air can oxidize linseed oil (e.g. oil paints, intaglio and lithographic inks) and other organic oils and turpentine, releasing heat in the process. If this heat can build up, for example a pile of oil-soaked rags in a corner, spontaneous combustion occurs resulting in a fire. Heat and ultraviolet (UV) radiation are sources of energy that can react with many chemicals to decompose them. Examples include the production of hydrogen cyanide gas from heating or exposing potassium ferricyanide (Farmer's Reducer) to ultraviolet radiation, and the production of acrolein, a strong respiratory irritant and allergic sensitizer, and other decomposition products from the overheating of wax. Table 2 lists the incompatibilities of many common art materials. It is important to store art materials safely so that they will not react with each other if there is an accident and they mix. Incompatible chemicals should be stored separately to avoid this problem. For example, oxidizers should be stored separately from other chemicals, particularly combustible ones. Acids should be stored in a separate acid cabinet, with concentrated nitric acid stored separately from other acids. In addition, materials such as zinc plates should be stored away from even dilute nitric acid solutions because of the risk of an unwanted chemical reaction occurring in case of spills. zinc, nitric acid Produces nitrogen dioxide and hydrogen gas. 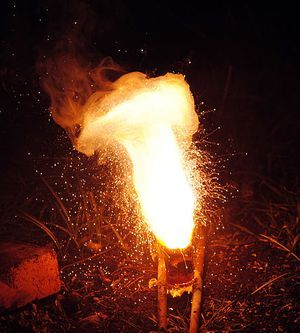 Mixing hydrochloric acid and potassium chlorate produces chlorine gas. Heating produces sulfur dioxide gas. Overheating and ironing out wax creates acrolein and other decomposition products. Cleanup rags, paper towels Oil, turpenting, lithotine or d-limonene soaked rags or paper towels can cause spontaneous combustion. Fuel-fired furnaces and kilns, gas, wood, etc. Produces carbon monoxide from incomplete combustion. silver soldering : Fluorine-containing fluxes decompose to fluoride and hydrofluoric acid fumes. castingwax burnout Produces acrolein and other decompostition products. hypo and sodium bisulfate produces sulfur dioxide gas. sulfide and sepia toning Produces hydrogen sulfide gas. selenium toning Produces sulfur dioxide gas. heating,machining plastics Produces decomposition including hydrogen cyanide from polyeurethanes, hydrogen chloride from polyvinyl chloride and methyl methacrylate from Plexiglas. bisque firing Decomposition of impurities in clay produces carbon monoxide, sulfur dioxide, etc. Decomposition of salt to hydrogen chloride resulting in hydrochloric acid. Raku firing Smoke and carbon monoxide from reduction firing in sawdust, leaves, etc. Zinc chloride fluxes decompose to hydrochloric acid. Other fluxes also have hazardous decomposition products. Welding arc welding Produces ozone and nitrogen dioxide. Wood workingparticle board, plywood Machining decomposes formaldehyde-based glues to formaldehyde. alkalais Neutralization of acid with alkali releases heat which can cause boiling.